Rhys Hoskins has proved to be a force at the plate. Expect even bigger things now that he's back at his natural position of first base. 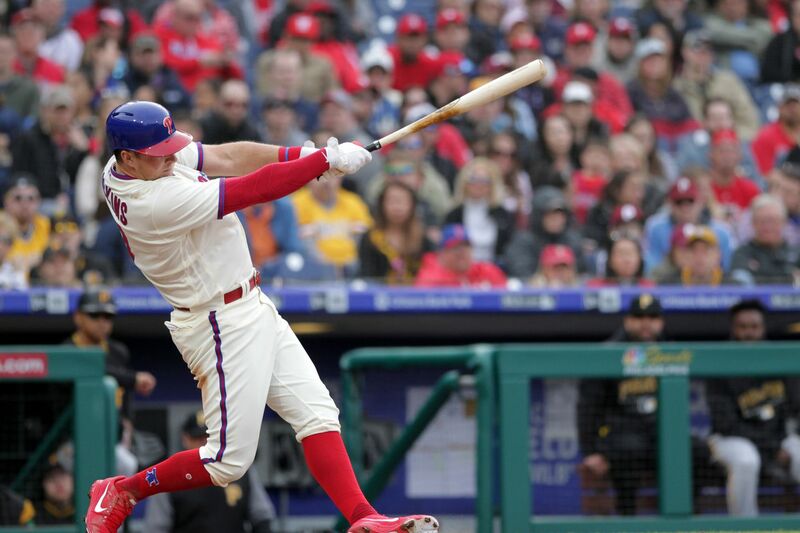 He’s actually played a little more than one full season, but Rhys Hoskins already is on the verge of cracking the Phillies’ franchise top 50 in career home runs. Not bad for a fifth-round pick who turned just 26 earlier this month. Hoskins has averaged one homer every four games and has hit 30 of his 52 career bombs at Citizens Bank Park. Here are some facts, figures and lists to try to sum up Hoskins’ first 200+ games. » The Phillies are 28-21 when Hoskins homers. » He and the Yankees’ Aaron Judge are the only players in baseball history to hit at least 40 homers and register 100 walks through their first 162 career games. » His 18 go-ahead homers in 2018 were tied for the second most in baseball (Oakland’s Khris Davis had 21) and were the most by a Phillie since Ryan Howard’s 18 in 2009. » Led the majors last season in pitches faced per at-bat (4.42). » Was tied for seventh in the National League with 34 homers and 10th with 96 RBIs. » Travis Wood, the Padres pitcher who gave up Hoskins’ first career home run in 2017, is out of baseball. Wood hit a grand slam in 2013 while playing for the Cubs. Hoskins has yet to hit one in 15 plate appearances with the bases loaded. » When Hoskins was at double-A Reading, the first basemen ahead of him in the organization were Brock Stassi (triple A) and Tommy Joseph (Phillies). Hoskins, who enters the 2019 season with 203 career games, is one of 12 players in history to hit at least 50 home runs in his first 203 games. Lots of interesting names on this list. Some notable players, past and present, and when they hit their 52nd career homers. *Stats are through the game in which each player hit his 52nd home run. Research using Baseball-Reference.com contributed to this report. This is Rhys Hoskins' dog. His name is Rookie. He's here to brighten your day.